My goal when I started CiclaValley was to share positive, uplifting stories to encourage people to take up cycling. As all things CiclaValley grew and I entered the world of bike advocacy, my community only continued to grow. This has been a second of life after being stuck behind a computer for so many years. Through cycling, I can go into any part of Los Angeles and find someone I know within a 15 minute ride. While I feel incredibly blessed for the experiences biking has brought me, it also brings me great pain. When a tragedy strikes, I’m now about two degrees of separation from the victim. This is gut wrenching to deal with, but the numbers have been so high lately that finding that base where your life feels normal has escaped me. There’s no prescription for dealing with this inner turmoil and the best I can do is participate. 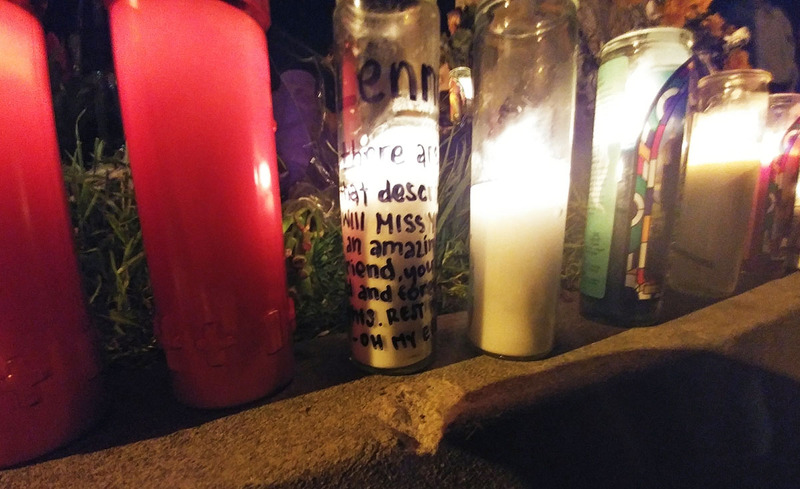 Lenny Trinh’s death happened on Alameda and Mariposa, a route I frequent often. Uncle Ted posted an unverified report of an incident and I texted my friend that lives within sight of the intersection. As I sent the message out, I realized it the collision happened at the time of day he would normally ride. Waiting for a response left me completely unbalanced. If not, how do you rationalize it’s somebody else? Everyone has a chain of loved ones that would suffer. When he texted back and confirmed all the morbid details, there was no sense of relief. Already, I knew for personal reasons that this was going to be one of my most chaotic weeks of my life, yet how do I take time away from my responsibilities and family? I don’t know anymore. I just do it. On Monday afternoon, I posted the event on Facebook and within moments I got a message from my friend Blanca that she had a bike to donate. Normally, I follow Danny Gamboa’s lead on this, but since he lives down in Long Beach, I wanted to take some of this work off of his hands. Two week ago, I met Steve at Sebastian Montero’s placement and we’ve started a dialogue about helping set up a network in the Valley. Unfortunately, Monday was the day to get into action. I got to the site roughly 15 minutes early and I knew by the group already assembled that this was going to be an oversized assembly. Walking up, there was already a large memorial in place topped with a Postal Service shirt attached to the tree with what else but shipping tape. I met some of the family and after saying a few words, some of them stepped forward to pay their respects. One of them led with a prayer spoken in Vietnamese. While I don’t speak the language, listening to the cadence was both calming and cathartic. Through all the difficulty the last few weeks, just closing my eyes and letting go was a moment of peace that has been absent in my daily life. 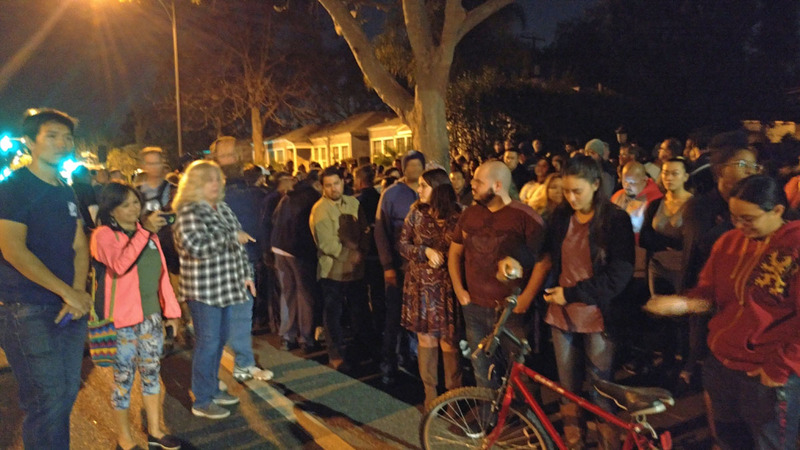 Steve rolled up with the bike, but the crowd had already grown to two hundred meaning maneuvering around to paint and place the bike was going to be awkward. Fortunately, a couple of squad cars from Burbank Police rolled up and helped direct traffic around the overflowing site. 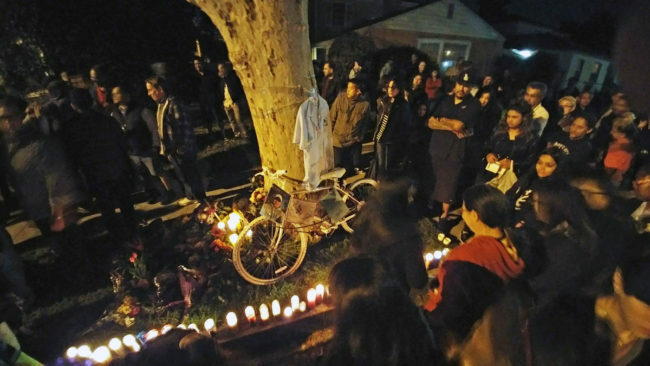 On top of the large representation from friends and family, there was also a big number of bike advocates who showed as a sign of support for the recent tragedies across Los Angeles. Lenny’s daughters did the painting with that competitive nature siblings have and while the bike was drying, a number of friends stepped up to share stories bringing him to back to life and smiles to everyone’s faces. Even after seeing a photo of the site earlier in the day, I was not prepared for as large of a tree that was set up. Fortunately, Rob who knew Lenny through his bike shop H & S up the street ran back to get a longer cable. 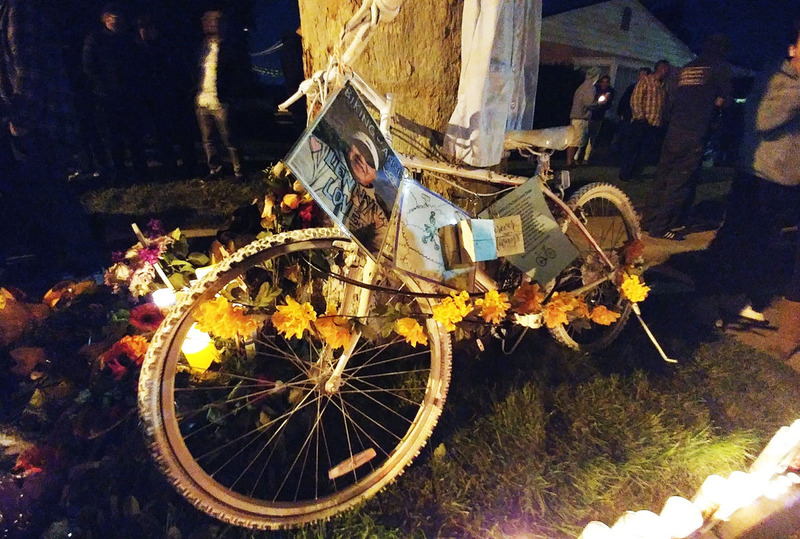 The bike was locked by his daughters and while the ceremony was over, the crowd still lingered. Through all the haze, I forgot to thank the members of Walk Bike Burbank for helping to organize this. While it was heartfelt to experience this amount of love and support, you hate that a tragedy like this is what brings it together.